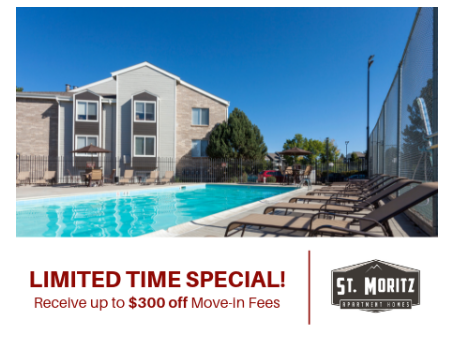 St. Moritz is an apartment community dedicated to offering our residents the best in quality apartment living. Set against a backdrop of mature trees and rolling lawns, the community of St. Moritz offers you the perfect suburban retreat while still keeping you just minutes from the action of downtown Denver. The one and two bedroom apartments located in Lakewood is five minutes from the Colorado Mills mall and a quick drive from both I-70 and the light rail. Whether you crave tranquility or the vibrant pulse of the city, St. Moritz makes it easier than ever to combine your home with the pursuit of your passions. The attention to detail in each one and two bedroom residence at St. Moritz sets this community apart. You can unwind to the crackle of a fire in your custom, wood-burning fireplace or share laughs with friends on your private patio. Beautiful oak cabinetry and vaulted ceilings are available in select homes will give your personal space a timeless touch. The amenities package at St. Moritz allows you to pick your path to contentment. You can surf the web at the onsite Business Center or during the summer, relax in the community swimming pool and spa. Regardless of your schedule, the twenty-four-hour fitness room will always have time for you. Contact the St. Moritz leasing center today for additional details.